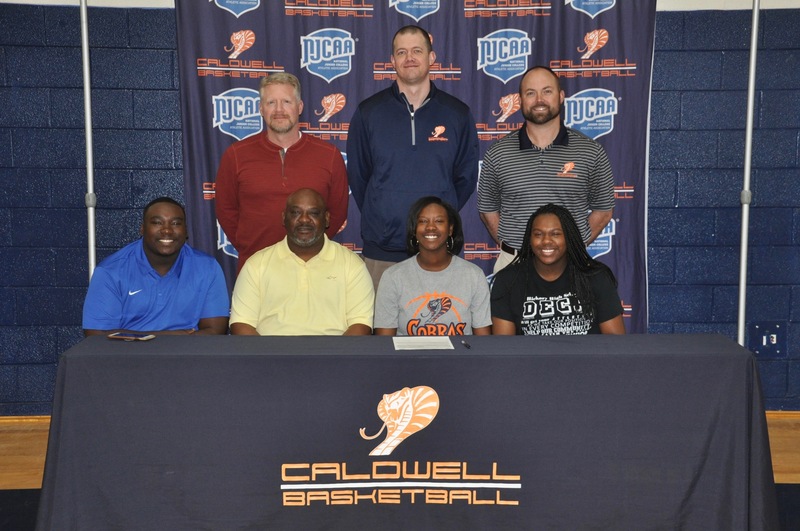 Mikayla Hill, a 5-foot-9 senior forward last season at Hickory High (front right), has signed to play basketball at Caldwell Community College and Technical Institute (CCC&TI). She’s pictured with her brother, Malik (front, far left), her father Marcus (front, left) and her sister Mariah (front, far right). On the back row, from left, are CCC&TI’s Dennis Seagle Jr., head women’s basketball coach Richie Covington and athletic director Matt Anderson./CCC&TI PHOTO.